Well, I have an alternative for those of you who are sweltering. 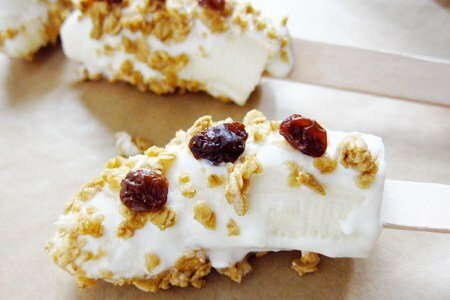 Try this - a frozen banana with granola stuck to it. This is the opposite of a bowl of cereal with a few slices of banana. You have a banana with a few slices of cereal! Why does this work? First, it is cold which will feel good in this summer heat. Secondly, it is fun. Everything is more fun served on a popsicle stick (I am looking at you Filet Mignon). Finally, these are easy to make. All you need is some popsicle sticks (which you can find at craft stores), bananas, yogurt, granola, and some optional raisins or chocolate chips. The best part is you don’t have to fire up your oven to make these. Just put them on some parchment paper in your freezer and the next morning you are looking like “Super Mom” as you hand them to your children. Yes, you can wear a cape (I do). These also make a great snack or replacement for those traditional sugar filled multi-colored popsicles. Have you tried a frozen banana treat? Slice bananas in half and insert popsicle sticks into flat section. Pour yogurt and granola onto seperate plates. Put a piece of parchment paper on a cookie sheet. Add yogurt, spread on granola, add optional raisins, and place on cookie sheet. Freeze for 12 hours and serve! I saw your tweet and couldn't resist brekkie on a stick! Awesome idea. What a great idea! It looks so yummy I am going to have to try this. I tried the chocolate covered ones and the banana is very hard to eat when it is frozen solid. This looks really good right about now. I will def be prepping these tonight! Thanks for the awesome idea. Great idea...I have had frozen yogurt but I don't think that I have ever had frozen banana. Your post is too funny!! I can almost imagine myself in the cape while handing out the popsicles, hahaha! Good idea, Lisa, but I make a "killer" shake in the morning, this could be a good snack for me, as we eat 5-6 times a day. Wow this is soooo simple & looks delish! A true must try! My friend asked me if I wanted a frozen banana. I said no. But then I thought I might want a regular banana later....so.....yeah. Seriously. Looks great. Gonna try it! I love chocolate frozen banana. I will have to try this recipe.